Double Attack Blackjack is a blackjack variation made from Spanish 21. Double Attack Blackjack pays even money on the player getting a blackjack hand but what makes this blackjack game interesting is the fact that the player has the option to double their wager after seeing the dealers up card, this is where the Double Attack comes from. 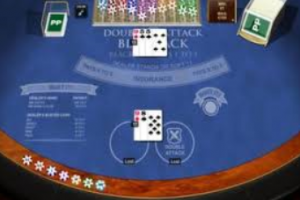 Double Attack Blackjack uses 8 decks of regular cards with 4 tens removed, the dealer stands on a soft 17, the dealer has the option to peek for blackjack should the player decide on taking insurance, the insurance pays out at 5/2. The player can double after splitting, splitting aces doesn’t result in the player receiving one card and all cards except aces can be split up to four times.